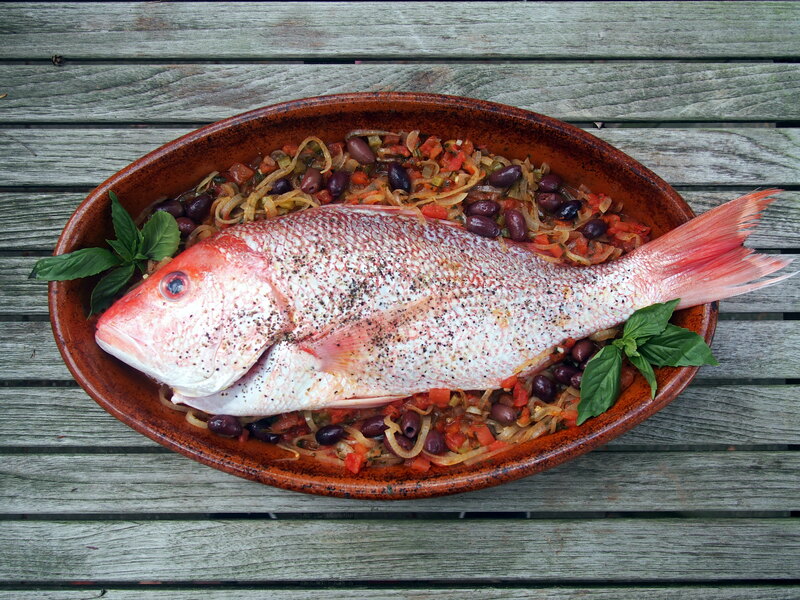 The red snapper is an iconic American fish native to the western Atlantic Ocean and the Gulf of Mexico. It can grow to 40 inches in length, weigh up to 50 pounds and live for as long as fifty years. It’s preferred habitat changes as a snapper matures. Newly hatched fish stay in shallow waters, then move to low-relief habitats like oyster beds. As they get older, they move to rocky bottoms, ledges or coral reefs, including the artificial reefs formed by offshore oil rigs and shipwrecks, and eventually on to deeper waters. 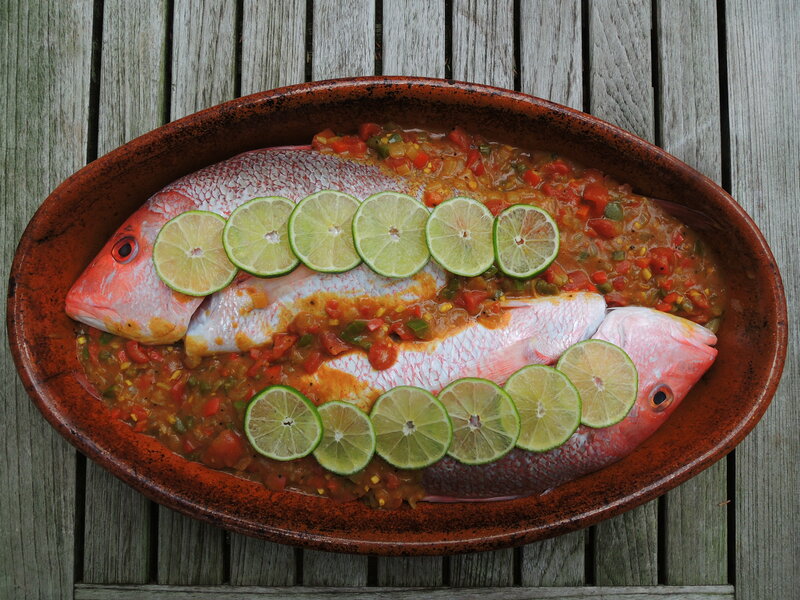 In Spanish-speaking Latin America, red snapper is called huachinango or pargo. Snappers have been harvested off the southeastern United States for well over a century and they are extremely popular with both commercial and recreational fishermen. The result, of course, has been overfishing, which reached its low point in the late 1980s and resulted in the institution of new rebuilding plans that limited annual catches, prohibited catching juvenile fish and improved conditions for reproduction. As a result, the snapper appears to be on the road to recovery. 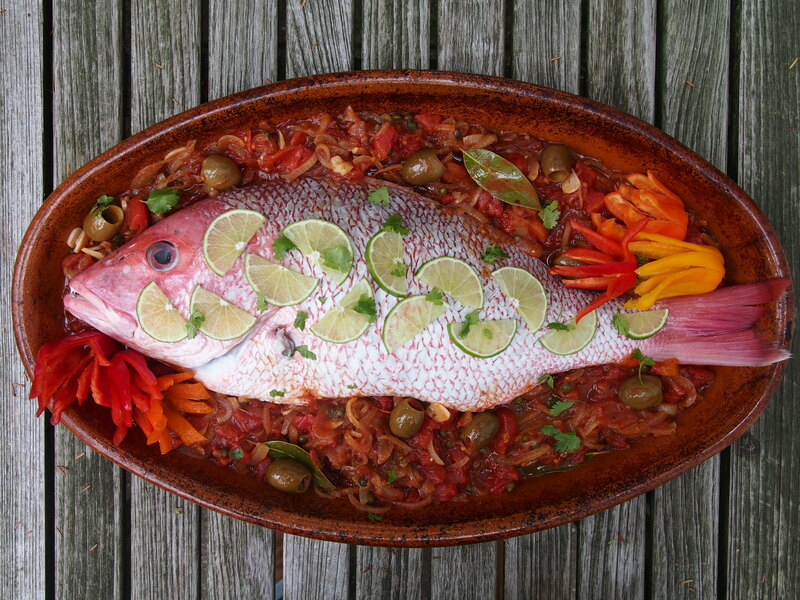 The Monterrey Bay Aquarium’s Seafood Watch recommends seeking out wild red snapper from the Gulf of Mexico rather than from the South Atlantic. Party menus often include more than one entree to accommodate differing food preferences among guests. For the cook, this means juggling multiple balls as serving time nears. You need to choose dishes that not only complement each other, but that also demand space in different appliances and require your attention at different times. If, for example, you are grilling a butterflied leg of lamb, roasting a whole fish is a logical choice. 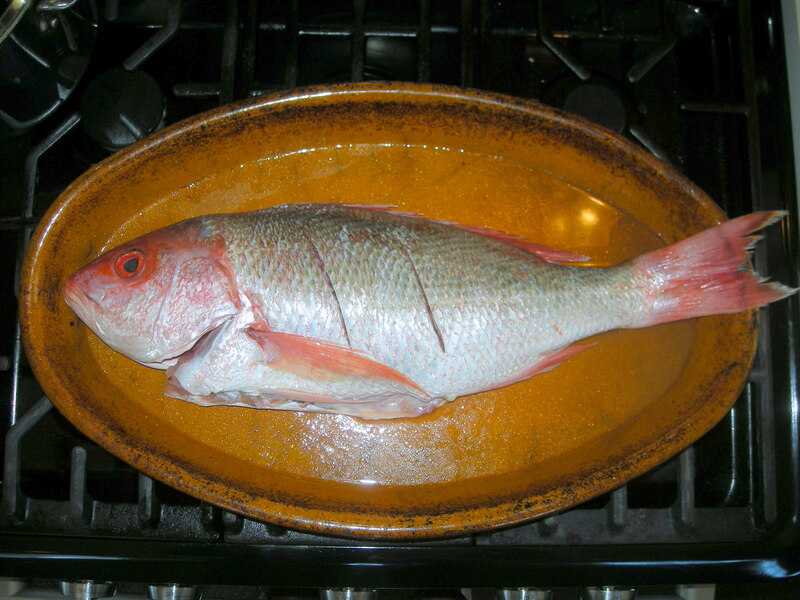 Not only does fish offer a welcome alternative to red meat, but it is cooked indoors and, once it has gone into the oven, it requires little attention other than to remember when to take it out. 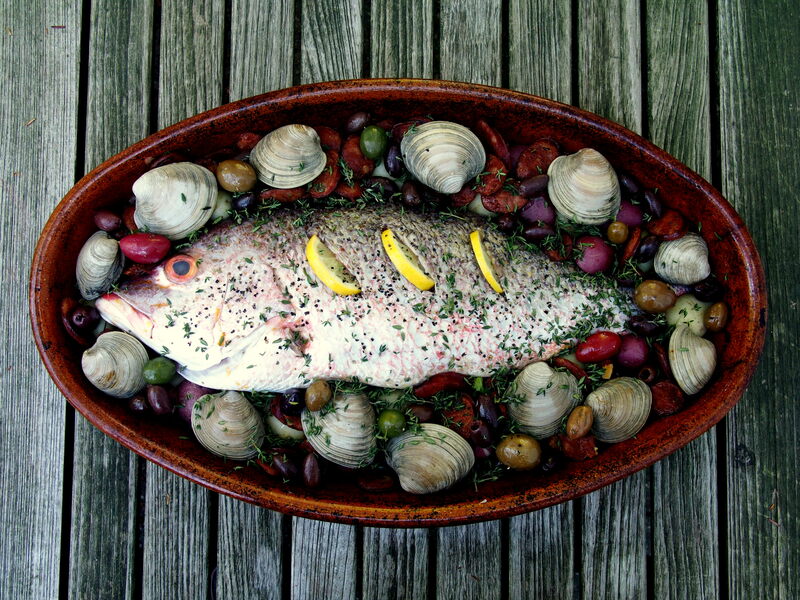 Your fish monger may not always have snappers this large, so if you are planning to do a whole fish for a party and want the, dare I say, splashy presentation, order your fish in advance. If you are living in a New York City apartment, you may also want to check the size of your oven – some will not accommodate a big fish. Two smaller fish can be substituted if necessary. And you also can go even larger, if your oven and baking dish are accommodating. 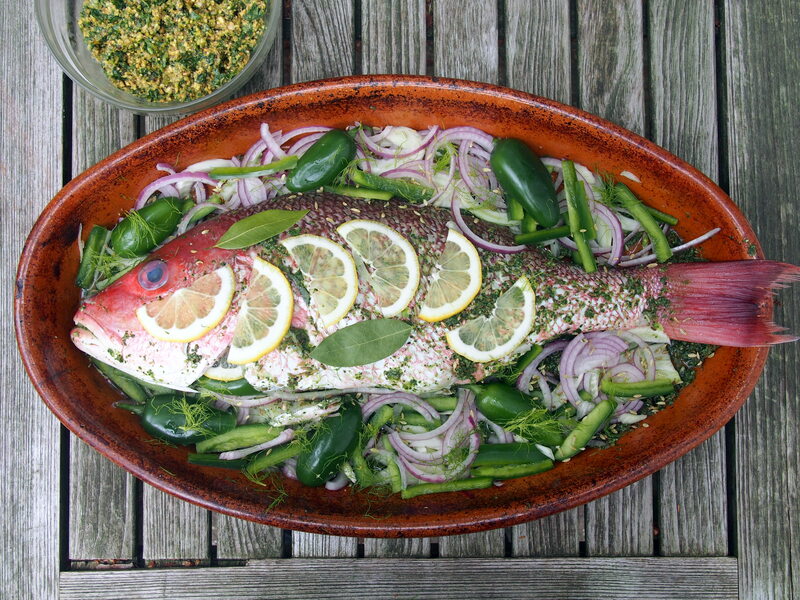 For an 8 pound snapper, double the amount of any sauce and bake the fish for 1-1/2 hours. 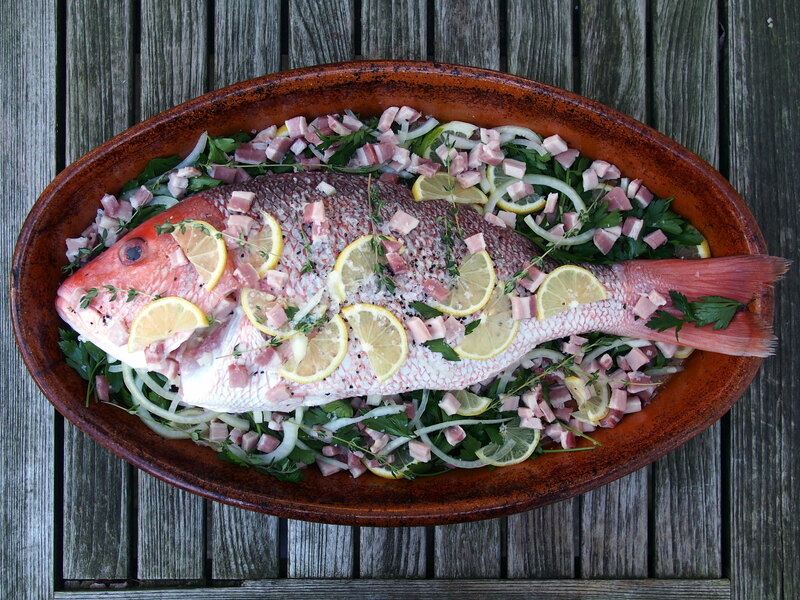 Striped bass, bluefish or any other whole fish can be substituted in the recipes that follow. Refrigerate the fish as soon as you get it home. 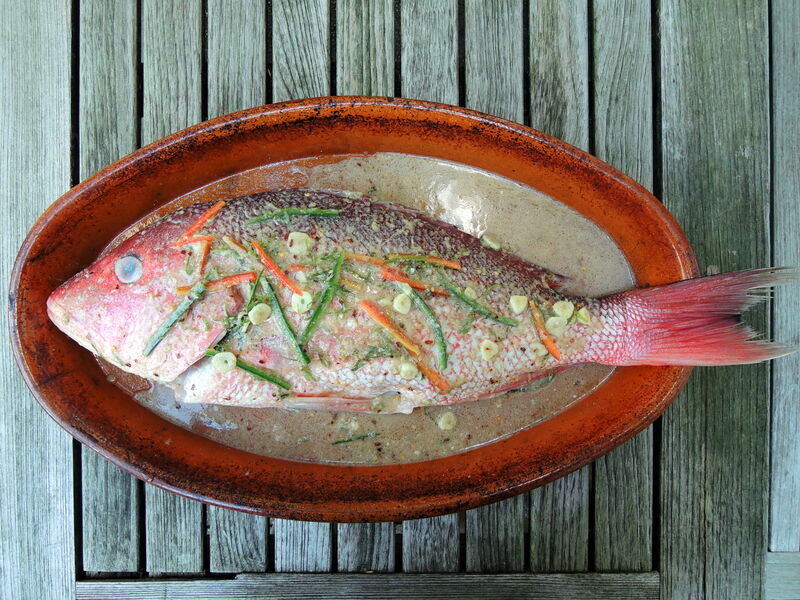 For a big fish, it’s useful to have an oven proof baking dish that is attractive enough to serve from. While moving a 4 pound fish from pan to platter can be done, it’s disappointing if your beautiful fish breaks to bits mid air during the transfer. This is even more of a problem if you choose to grill the fish since the skin often sticks to the grill grate. 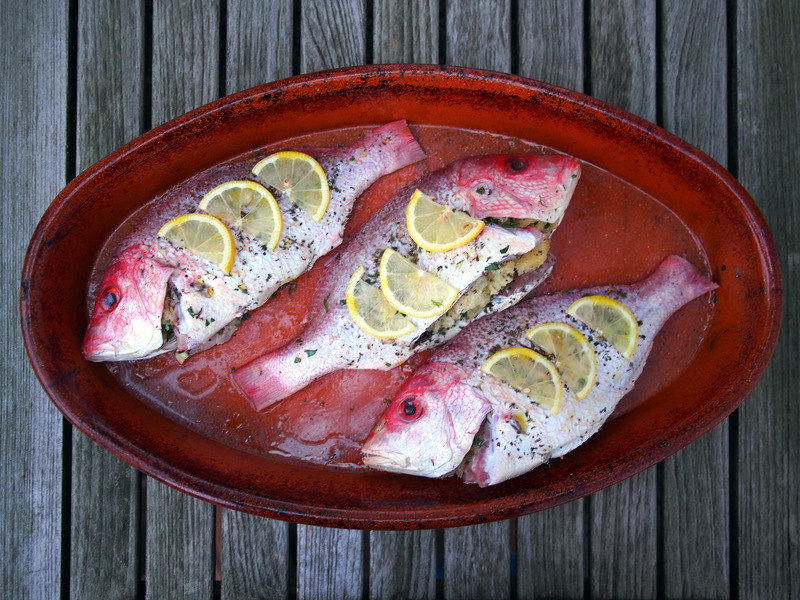 To grill a large fish, slide it onto a cookie sheet and transfer to a heated grill (the charcoal should be glowing red, with white ash and no flames). Cover and grill fish, without turning, until it is cooked through, about 45 minutes.